With the holidays upon us I thought I'd do a quick post this afternoon to wish all my readers a Merry Christmas and all the best for 2009! 2008 has been a very busy year for the City of Grande Prairie and I think we'll see the same in 2009. Of course we're aware of the concerns out there about the economy but over all I believe that our region will enter '09 in at least as strong a position as any other city in the province, or country for that matter. Exciting things are happening in our city; construction has started (finally) on the swimming pool / multiplex, the new Library/Art Gallery will open this spring and this winter our roads are benefiting from the extra $1.3m in snow removal budget passed last year. I'm going to try to do a year end wrap up over the break so check back for that as the new year approaches. "ANKENY, Iowa (AP) — Slush has never smelled so spicy. City crews in the Des Moines suburb of Ankeny are using garlic salt to melt snow and ice on streets from Tuesday's storm. The salt was donated by Tone Brothers Inc., a top spice producer headquartered in Ankeny. Public Works Administrator Al Olson said the company donated 18,000 pounds of garlic salt to use on its 400 miles of roads. Olson doesn't have details, but he said the salt would have ended up in the landfill, so the company donated it. A telephone call Wednesday to Tone Brothers wasn't immediately returned. Olson said the city mixed the garlic salt with regular road salt and it works fine. He said some road workers say it makes them hungry, but Olson doesn't recommend it to spice up lunch or dinner." That town is going to smell great come spring - I see an upswing in business coming for the local Italian restaurants! At last night's council meeting we approved the budget for 2009 as well as what should be considered a draft budget for 2011. Of course there is always a lot of public comment & media coverage with municipal budgets and taxes in general. Usually the discussion rotates around how much the taxes are or how much they are going up rather than what they are paring for. So I thought I'd try to find a little different way to show what your monthly taxes will be paying for in 2009. The charts below are based on a house valued at $350,000. Using the city's online tax estimator tool we can find out that the approximate municipal tax bill will be $2271.04 per year, or $189.25 per month. This first chart shows roughly how much of that $189.25 per month goes to different city departments. All the numbers shown in the chart are in dollars. 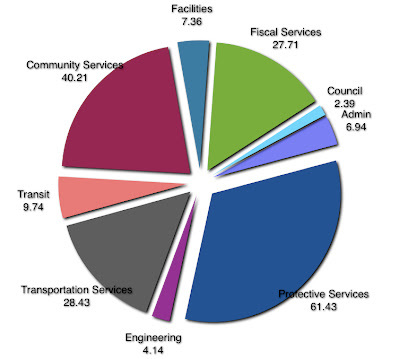 For example; of that $189.04 monthly tax bill, $61.43 goes to pay for the Protective Services department, $9.74 goes to Transit and $2.39 supports the activities and expenses of Council. This second chart breaks it down even further by looking at the $61.43 per month in the Protective Services Area. 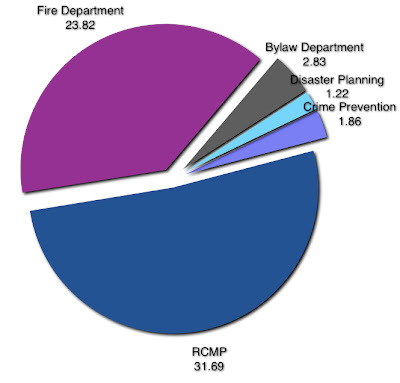 Of that total $31.69 per month goes towards paying for RCMP and $23.82 pays for the Fire Department. Ok, ok... I know it's likely that breaking it down this way isn't going to change how one feels about paying taxes. I do hope that it at least give a little perspective on the "value for dollar" that your local government is providing. By an interesting coincidence, the chart that inspired me shows that residents in Guelph are paying a similar amount for fire protection. At tonight's council meeting there is a motion to reconsider council's previous direction on the fate of the historic Prairie Art Gallery building. About 1/4 of the building was lost when the roof collapsed in March 2007. Since then it's sat open and exposed to the elements while it's fate has been bounced around and the insurance issues have been sorted out. Late this summer council passed a motion directing staff to seek permission from Alberta Culture & Heritage to demolish the building and begin construction of a new building on the site. At the time I was the lone dissenting vote - As I said previously I really believe the building is important given Grande Prairie's limited amount of historical resources. Apparently the ministry feels somewhat the same as their response to the City's request seemed to indicate between the lines that restoration was the way to go. The building expert the minister sent to inspect the site was pretty clear in his report that the building was still very salvageable. I think the motion to move forward with restoration and reconstruction will pass easily tonight given the letter from the minister and out-pouring of support old high school building we've seen over the last few weeks. The collapsed Prairie Art Gallery building (finally) gets a temporary roof to protect the structure while it's fate is decided. Workers installing the roof on the old gallery building. This picture shows the connection area where the new cultural centre is supposed to connect to the old art gallery building. The connection hasn't been built yet because of the uncertainty of what would happen to the old building. Have you every actually read the Universal Declaration of Human Rights? I have to admit that although I'm sure I've seen it many times I couldn't recite it. I found this clip on the Oscio website and I have to be honest, it gives me chills when I watch it. I can't help but think; what if every nation on Earth abided by the principles laid out here? Or, even closer to home; what if the needs of every person in Canada were addressed in accordance with the Declaration? I was really disappointed last week. Thank you for your recent e-mail confirming that the City of Grande Prairie is offering to be a pilot site for internet voting for the 2010 general municipal elections conducted under the Local Authorities Election Act (LAEA). To confirm our discussions and followup letter to your mayor, at this point in time, internet voting is not permitted under the LAEA, but there is an ability to pass a regulation allowing an elected authority to prescribe a system for the conduct and procedure of an election or vote not provided for in the LAEA. If the city was interested in pursuing alternative voting, a business case would have to be presented to request internet voting. The business case would need to address the pertinent issues, such as the need for internet voting in the city, who is the licensed provider, how is security guaranteed, how is voter validation dealt with, what are the costs, how are results verified and recounts conducted. I understand you have provided a contact with a company that may be supplying internet voting services to the city. For the ministry to review your request, the city needs to present a written business case addressing the potential security, privacy, validation and process issues that may arise as a consequence of implementing internet voting methods. Once we have received the information from the city on the process issues noted above and anticipated costs, we will further review your request. The Minister's response isn't what I was disappointed in, after all he's basically asking for more info which is reasonable. This idea is gaining steam, Grande Prairie had resolution adopted by the AUMA in 2007 and now it looks like Edmonton is catching on to the idea (from this article you'd think it was their idea). This will be reality eventually and the Minister wants to cover all the bases, that's fair. Anyways, what disappointed me was what happened when I tried to move the process along. The short version of the story is: I made a motion asking administration to come up with a plan on how we could put together a business case, including what it would cost to do so. The Mayor spoke against my motion saying that it would be an example of provincial downloading. The vote was called on my motion, Mayor Logan & Alderman Minhas voted against it while Alderman Rice and myself voted for it - and on a 50/50 tie, the motion was defeated. So anyways, my mood right then is probably what caused me to sound so fatalistic in the newspaper interview. But, upon reflection... I've decided not to give up. Designated by the UN in 1985 International Volunteer Day is a time to thank the volunteers in our communities for their efforts and increase public awareness on their contribution to society. During the course of my work on council I've realized that with out volunteers our city would be a very, very different and depressing place. If you are looking to volunteer, to support the work of volunteers (or even for a way to thank volunteers) in Grande Prairie you should contact the Volunteer Services Bureau. Thanks to all you volunteers out there! The Giving Tree in the Children’s Library will be accepting stocking stuffer donations from December 1 to December 19. New items such as socks, toothbrushes, hats, mitts gratefully accepted. Donations will go to the Odyssey House. Join us for weekly German lessons as you learn with Auralog, the language learning software now available through the Grande Prairie Public Library. Learn how to use the software and then practice at home and with the group. Registration is required. Maximum of eight participants. Materials fee: $5.00 This program will be 12 weeks. Beginning Thursday, January 15 at 7:30 pm in the Isabel Campbell Room. For more information and registration call Luba at 532-3580 ext. 259. Writers come one, come all. Start thinking about entering one of Alberta’s best writing contests! There are five entry categories: Grades 1-3, Grades 4-6, Grades 7-9, Grades 10-12 and Adult all with great cash prizes. Pick up a brochure for specific guidelines at the Library or online at www.gppl.ab.ca . The Children’s Library will begin accepting submissions Monday, January 5, 2009. Contest closes Friday, April 3 at 6:00 pm. Wrap up your Library this Christmas! Put your Library under the tree this year. Purchase a Library membership for that hard to buy for person on your Christmas list and give them unlimited movies, books and CDs all year long! Gift certificates are available at the Circulation Desk. Did you know that your Library offers extensive and credible reference sources to answer all your questions? From music to history, literature to business, your Library has an online research tool. Use of these online research tools is included with your Library membership. This month’s featured tool is Credo Reference. Credo is a vast online reference library, providing access to the full text of hundreds of highly regarded and popular titles. Credo brings the facts alive with images, sound files, animations, videos and much more. Find speedy, simple answers and full in-depth articles. Credo Reference is constantly expanding and currently offers around 300 quality reference titles on every major subject. You can access over three million cross-referenced, searchable, authoritative entries a growing world of information at the click of a mouse! Credo Reference contains dictionaries, bilingual dictionaries, thesauri, encyclopedias, quotations and atlases. Plus a wide range of subject-specific titles covering everything from the arts to accountancy, science to Shakespeare and law to literature. To access the online research tools, visit www.gppl.ab.ca and click on Online Research Tools in the left hand menu. Have your Library card ready. City residents have one further chance to have their say into the future of Muskoseepi Park. An open house to review the Muskoseepi Park Master Plan is set for Wednesday at 6:30 p.m. in the Muskoseepi Park Pavilion. This is the last opportunity for residents to provide input prior completion of the plan. Muskoseepi Park includes Bear Creek North, the Reservoir, Crystal Lake, Centennial Park, the Trail System, and Bear Creek South. Information on the survey feedback will be provided at the Open House. All the goals will be collected from the public input and these will be formalized into recommendations within the Master Plan. The document is due to be finalized in April for City Council approval.